China's doctors have a lot to be unhappy about. Low pay, long hours, medical disputes that trigger abuse and violence from the public - and daft regulations that force them to publish a quota of 'scientific articles' every year even when they have no interest in research. 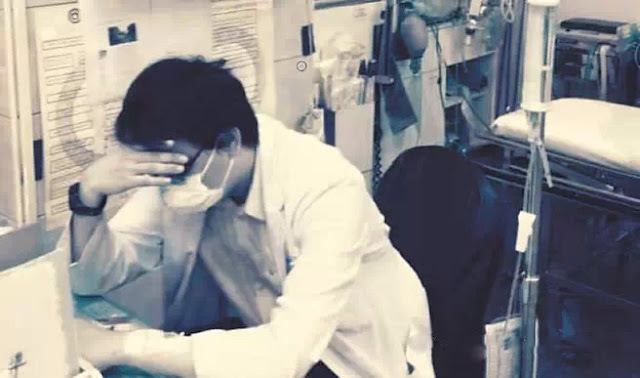 There has been a lot of talk about poor morale among China's medical profession in recent years, but very little actual research to back these claims up. To address this, the medical online portal DXY conducted a survey in September 2015 that asked a simple question: "do you regret becoming a doctor?" Responses were obtained from 2,356 doctors, three quarters of whom were male and most were working in tertiary (teaching) hospitals in eastern China (not surprising given that DXY is a medical portal used predominantly by younger and more online-savvy medics). The survey found that overall almost half of doctors (1146) said they had regrets about becoming a doctor. There was no significant difference between male and female doctors, but there were some interesting trends by speciality and location. Emergency department doctors had by far the lowest morale, with almost three quarters regretting their choice of career. This is perhaps not surprising as emergency doctors are at the sharp end, doing exhausting shifts dealing with trauma - and being assaulted by stressed out patients and their families with complaints. Other specialities with poor morale included paediatrics (low pay, high stress when dealing with pushy parents of ailing Little Emperors), obstetrics and gynaecology and oncology. The specialities with the highest degree of job satisfaction (or least worst morale if you're a glass half empty person) were radiology, TCM and anaesthestics. The survey also showed that community clinic physicians also had less regret about medicine as a career - the study authors say this is presumably because they see less sick patients and are more likely to have an ongoing doctor-patient relationship in the community. Interestingly, doctors in teaching hospitals tended to have better job satisfaction - possibly because the top hospitals have better career prospects and are more professionally stimulating. The doctors in the middle tier hospitals - level 2 - had the worse morale. Trainee doctors and senior doctors also tended to have better morale whereas mid-career doctors in their 30s and 40s had the worst morale. On a geographic basis, doctors in the more remote provinces such as Yunnan, Gansu, and Shanxi reported better morale. The survey authors said this was an unexpected results and suggested that salaries were not as important as once thought in job satisfaction. The study authors say they now plan to publish a more in-depth analysis of the reasons given by the doctors for poor morale.